Clopidogrel besylate is a ticlopidine analog and platelet purinergic P2Y receptor antagonist that inhibits adenosine diphosphate-mediated PLATELET AGGREGATION. 2-Oxoclopidogrel is a metabolite of Clopidogrel. 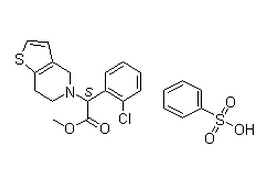 Gefapixant is an orally active P2X3 receptor (P2X3R) antagonist with IC 50s of ~30 nM versus recombinant hP2X3 homotrimers and 100-250 nM at hP2X2/3 heterotrimeric receptors. RO-3 is a selective P2X3 and P2X2/3 antagonist. Cangrelor is a high-affinity, reversible inhibitor of P2Y12 receptors that causes almost complete inhibition of ADP-induced platelet aggregate. Cangrelor is a P2Y12 inhibitor used as an antiplatelet drug for intravenous application. 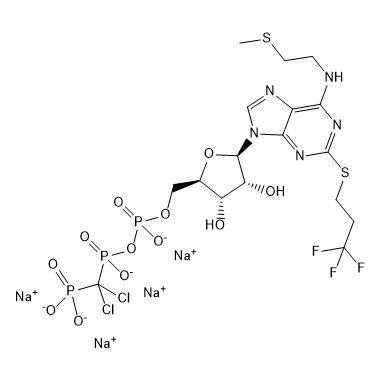 A-317491 is a non-nucleotide P2X3 and P2X2/3 receptor antagonist, which inhibits calcium flux mediated by the receptors. AZD9056 is a potent, selective, orally bioavailable P2X7 receptor antagonist. BPTU is a novel P2Y1 allosteric antagonist.